Above: Houseboat on Embankment Road, Bembridge, Nr. Brading Imagery by Google. But houseboats are not a new phenomenon, and whilst it's hard to pinpoint exactly how early on they were first being built, their existence was definitely documented by the mid 19th Century. In the 1861 census, the domestic use of boats can be observed. It is noted that just upstream of Oxford, 5 floating homes on barges were moored near Folly Bridge. 2 of which were built by boatbuilders Maximilian Davis and William Bossom. Now William came from a long line of builtbuilders; dating all the way back to the 17th Century, but it wasn't until the rise of railways that they swapped from building river trading craft, to building rowing boats and houseboats. Over the following years, multiple families set up a similar business, and feuds were not uncommon! Many of the families lived in boats around 14ft (4.2m) wide and at least 50ft (15.2m) long - much larger than the more usual narrowboats of the period! Fast forward to today, and Oxford is home to around 120 houseboats; still making it a rather lucrative lifestyle. Elsewhere, most houseboats can be found around coastal regions, particularly in areas of mudflats and marshes - where they are protected from any ocean waves, such as the houseboat above. It is estimated that over 15000 people live afloat in the UK, although most of these are likely to be narrowboats. The most common forms of houseboats are beached hulls of old ships, and converted barges, although there are a variety of other types; some more unusual than others. Above: River Thames, Richmond. Imagery by Google. Some even have a historical background (there have even been a few converted from D-Day landing crafts! ), whilst others are entirely handbuilt. In Shoreham, some of the more unusual houseboats use old coaches and even fire engines in their construction! 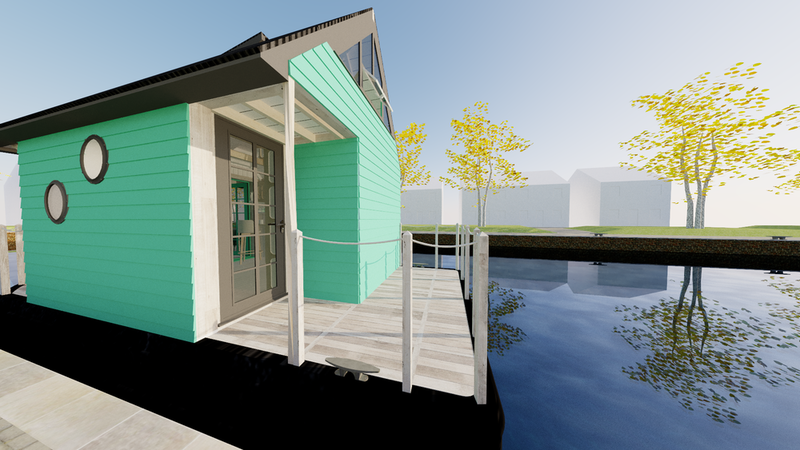 The beauty of floating homes is that quite often you can get away with more daring builds, although if you'd rather stick to tried and tested you'd probably have an easier time. As you can hopefully see from these Streetview images, they come in various shapes and sizes, but more affluent areas (such as along the River Thames) attract some rather large and impressive houseboats as can be seen below. Above: River Thames, Hampton. Imagery by Google. But fear not, I will be sticking to my more modest design principles as is the point of this blog! 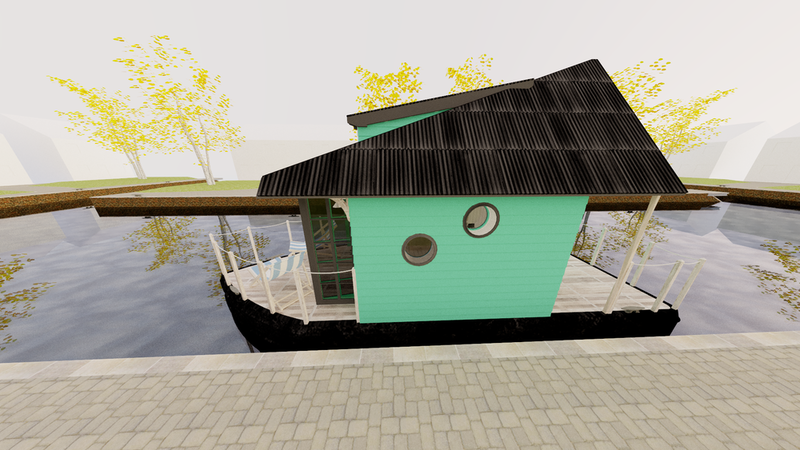 Before I move on to my design though, I think it'll be a good idea to look at the challenges of houseboat living. 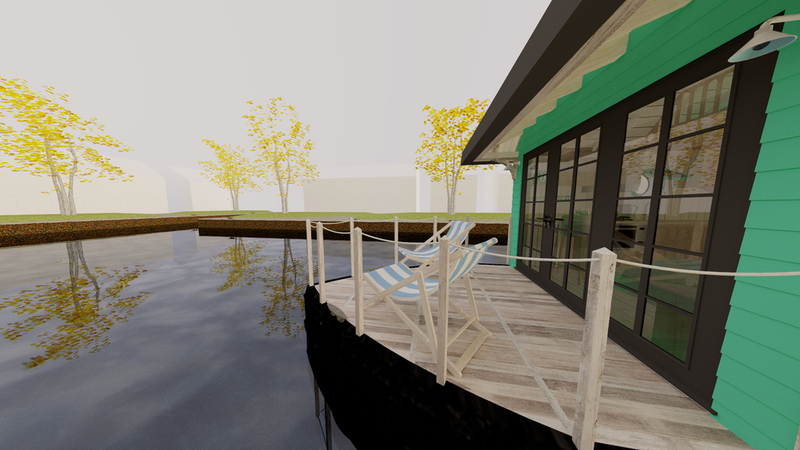 Whilst it may look and feel like you'd be living a dream lazying about on the water in your very own detached pad, the realities of houseboat living are not always as easy as you might expect. To start with, you're going to need a permit. On the UK waterways, the price of these can range from £120/month to £360/month... and that's assuming you'd be able to get one! Only when you've got your permit should you even think about buying your own (and again, prices of houseboats vary greatly; anywhere between £20k to £1 million!). What's more, much like tiny houses, banks are not keen on lending you money for a boat; so most houseboat owners are cash buyers! Above: West Mersea, England. Imagery by Google. There's something else though that needs to be thought about - houseboats will require inspection by an experienced houseboat surveyor to make sure it is seaworthy. Much like with narrowboats, yearly inspections are usually the norm, with the whole boat having to be lifted out of the water at a purpose built location. Even without any work needing to be done, this is expensive! But it's not all about the money, life aboard is very different from your average bricks and mortar house. It genuinely is a different way of living, and a big commitment. Assuming your houseboat isn't connected to any utilities, you will have to empty waste tanks frequently, and also be very wary of how much electricity you use. You'd also have to source fresh water, and remember to plan trips on the houseboat to coincide with watering holes. Things get a bit easier when you have a static houseboat though, and with a lack of engine, there is less to go wrong too! I think it comes as no surprise to find that the countries with large inland waterways are where the most houseboats can be found. Elsewhere in Europe, The Netherlands (and more specifically, Amsterdam which is absolutely full of waterways), has its fair share of houseboats - in fact, you can't walk one block without seeing one in the heart of the city! Nowadays, they are mainly reserved for the wealthy or for tourists, but in years past, houseboats were seen as a poor-man's home. There are an estimated 750 houseboats with a permit (ligplaats) on the central canal rings in the city. In total there are around 2400 in Amsterdam. But when the whole of The Netherlands is taken into account, a whopping 100 000 houseboats are legally parked. No new permits will be issued, so with a limited stock of locations, prices of these permits have soared; so much so, that even permits with a wrecked houseboat will sell pretty easily. Conversely, a luxury houseboat without a permit will be worth very little! Interestingly, as of 2005, every houseboat has been hooked up to the city grid and sewage network, so can be equipped with all the mod cons. Above: Amsterdamse grachten Canal, facing west, Amsterdam. Imagery by Google. The older houseboats are over 100 years old, and were usually converted from ships originally used to carry goods. During life in active service, there would only have been crampt living quarters below deck; low ceilings and a moist air would not exactly make a welcoming home. As the ships owners retired, quite often they would convert the rest of the ship into more comfortable accomodation; but even then, life would not be anywhere near as easy as modern day occupants would expect. Above: The Singelgracht Canal, facing west, Amsterdam. Imagery by Google. After WWII, cheap housing was needed, and even more ships were hastily converted to form living accomodation; although the quality of builds often left much to be desired! Come the sixties and seventies, houseboats like those above were springing up everywhere. These so called "arks" were often painted in bright colours, but even this doesn't seem to hide the concrete monolithic nature of construction! Above: Th. K. van Lohuizenlaan (Lozingskanaal, facing W), Amsterdam. Imagery by Google. Nowadays, many houseboats are built to a really high standard and specification; and as can be seen above, size appears to be no limit in some areas! As such, most command very high prices, but being in the heart of the city makes it a very convenient place to live for many. With a total of 26 square metres, it's a pretty generous size for this blog. The actual living space is around 19 square metres; the ground floor of the cabin taking up only half of the total hull size. At 3 metres wide, it's much wider than a British narrowboat, but still narrower than most barges. In actual fact, I think you'd struggle to find a barge this small! It's a very simple layout; the kitchen forming along one wall with the wetroom in its own extension out the back. The sleeping loft sits above the wetroom, and the rest of that end wall is taken up by the back door and porch; the loft forming the porch itself. A ladder leads up to the loft to reduce the impact on the downstairs space, and the multi-functional sofa bed makes for a comfy place to sit, and for a guest to sleep. Outside, the two decks form a welcome space. Speaking of which, the hull has a huge amount of space, not just for waste tanks, but also fresh water tanks. Not to mention that being low down in the houseboat means that the added weight will help reduce the high centre of gravity. So not only is it a useful space to increase your fresh water, grey water, and black water storage capacity; but it'll make the whole houseboat more stable. Presuming you are able to connect to grid power, you could even install a power-shower. Whilst there is a little bit of room for solar panels on the roof, I don't think you'd be able to fit enough to generate sufficient power for such power-hungry appliances. Elsewhere in the wetroom, we have the same sink and cabinet that was in last months' blog, but we also have some nice feature pieces. You'll see these elsewhere in the houseboat, too. We have decorative plywood circles that look like bubbles, but actually also perform a function; the larger one features a mirror, whilst the smaller ones have built-in shelving. The wetroom is then finished off with a small porthole for a little bit of natural light. 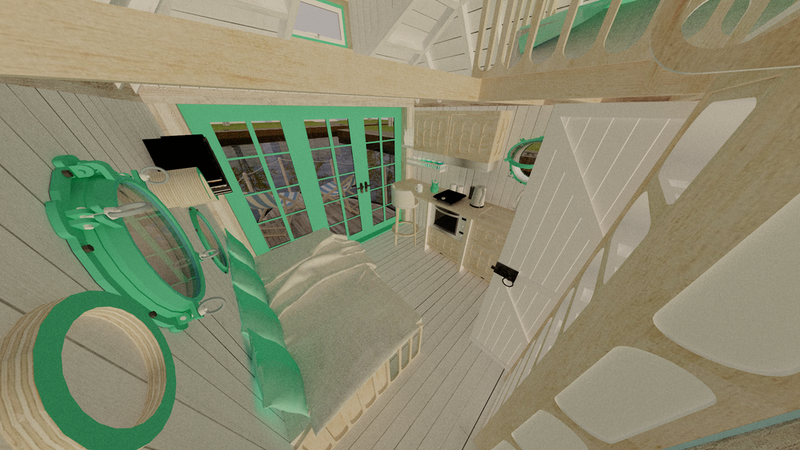 So, onto the main living space of the houseboat. As you'll see it's a nice bright and airy space, in part down to all the white painted boards and rafters. Having the whole space open up to the loft makes a huge difference than having it boarded off. In actual fact, you'll notice that the walls are only 2m high (you can tell because the doors meet the top of the walls); most houses have ceiling heights of around 2.4m, hence why opening the space up to the rafters is important here. Personally I prefer low ceilings, but I can guarantee the vast majority of people much prefer high ceilings of 2.4m or above. Either way, the rafters are not exposed in the true sense of the word; the rafters you see are actually non-structural ones added to give a better sense of depth and also to break up the large expanse of cladding. The load-bearing rafters are actually hidden behind the cladding itself, with the spaces in-between filled with insulation. This provides a fully-insulated building, without compromising on the charm that exposed rafters give a property. Immediately noticeable is the railing on the sleeping loft put in place to prevent falling down to the space below. I wanted some sort of basic but minimalist design that would allow plenty of light to the upstairs space, but also cross-ventilation. To go with the circular bubble designs of the wetroom, I felt an elongated "pill" design would suit the aesthetic well. The holes are also the maximum recommended distance of that between ballustrades (so children can't fit between them and cause themselves injury). This design is also carried down onto the ladder and top handrail "rings". You'll see that instead of adding a handrail going down the sides of the ladder, instead I've placed two "rings" at the top. From there, there are pairs of hand holes in the ladder rungs themselves which form a kind of climbing wall. Not only does this minimise the impact on the downstairs space (handrails can take up a lot of space), but it also provides a fun way to climb, rather than a flimsy ladder. I would imagine kids would love it! I didn't want to go with traditional thin rungs, so instead I went with a ladder/step combination. The downstairs area features the same basic kitchen set-up from last months' blog entry, but this time I really wanted to give a more playful style to it. To that end, the cabinet doors all have routed panels made up of curves (to symbolise waves). The "pill" shapes are also carried over from the railing design of the sleeping loft - giving a nice continuation across the space. If you really wanted a playful look, you might even consider painting various sections of the panels. As it's the same kitchen as last months', I won't go into detail again; but you'll see the sink/chopping board combo, the microwave oven, drop-down cutlery drawer and also the under-unit storage drawers. All furniture in this design is made up of marine plywood of various thicknesses, with the occasional pop of colour. Something worth mentioning is the huge bi-fold/single door combo to the left of the breakfast bar. This makes the breakfast bar a very pleasant place to eat and maybe even work with the views out of the glazed doors. However there's more to it, as the versatile nature of having multiple choices of doors open makes for an adaptable space; you can have one, two or the full three sets of doors open depending on your needs. If you're entertaining guests on a summer day, crack open all three doors and make the outside deck part of the inside. Or if you want a little cross breeze, just open one door and the back door. Along the final wall of the downstairs space is the daybed/sofa. Whilst the daybed equates only to a small single, the houseboat is designed for one person to live in - so it would be seldom used, perhaps only for the occasional guest. Inside the drawers there is plenty of storage for everyday items. Again, it's mostly made of various thicknesses of marine plywood, with colourful drawers to bring out the playful side of the houseboat. And speaking of which, there's plenty here to appeal to that side of it; the bookshelves are waves formed from multiple layers of plywood glued together, there are two portholes (one openable), and the "bubbles" also make a return. Of course, the option is there, if you wanted, to make these "bubbles" deeper to form more storage for small decorative items. Hell, you could even make a whole wall of them and really make a striking feature piece! So we'll move onto the penultimate part of the houseboat; the sleeping loft. We've already looked at the handrail and ladder at length, so the rest of this small space won't take long. And small it definitely is! Since it is only a sleeping loft (and not a bedroom), it's only designed to be used to sleep in (funny that! ); as such, it contains only a bed and a bit of storage. Again, the bed is a single (although full-size this time). My original design had a queen sized bed, but in reality this would have left no room for storage. Not only that, but this would have left the access ladder in the middle of the main space, making the kitchen very awkward to use. Originally I also had alternate tread stairs (the same curved version as last months'), but again, it took up too much space; hence why I reduced it to a single bed with access ladder. Given an extra metre of length and another half metre of headroom, I suppose you could have a queen sized bed up in the loft. As many of you know though, I originally started this blog as a way to design my own dream tiny homes; and as such I design mostly with one-person living in mind. Don't forget; I'm always up for taking suggestions; so if you want to see a space fit for a couple with kids, let me know in the comments below! Anyway, the main selling point of this tiny loft is the glazed wall. This allows not only an abundance of natural light and good views, but makes the space feel much bigger than it really is. The shelf that is formed by the window sill also makes a nice place to put personalised items. You may have noticed the dormer window above the main living space downstairs. The reason for this is three fold; natural light, extra headroom/vertical space, and cross ventilation. With this dormer window and the rectangular window in the loft open, you'll get a nice fresh breeze; keeping the space airy. So we venture outside to the final areas of the houseboat; the decks. We'll start with the smallest of the two - the rear deck (behind the wetroom). As we step out the back door, you'll note it's still under cover - the sleeping loft helps form a porch to protect you from the rain as you board the boat. 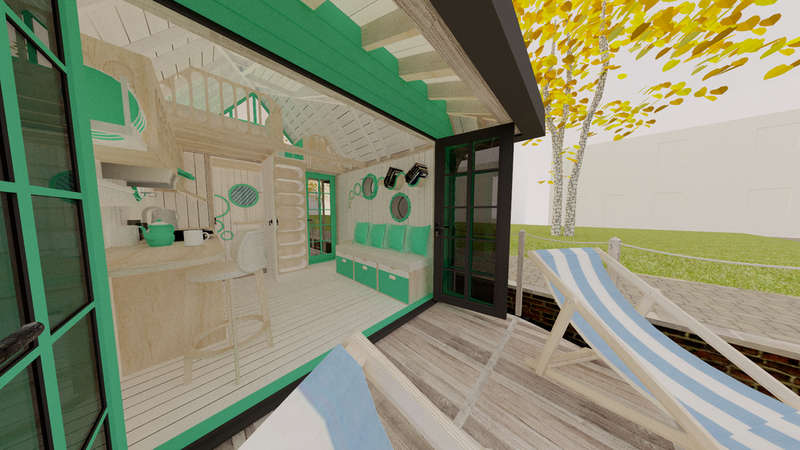 The small deck itself is only 3m x 1.2m, so not exactly spacious, but it would be enough room for a lounge chair (not much else though!). The mooring cleats are bolted onto the hull itself, with some rather nice reclaimed deck timber forming the surface. It's a similar story as we move to the larger front deck. It's still not a large space, but it's definitely a great spot to sit and enjoy the warm summer evenings; whether it be alone or with a friend. 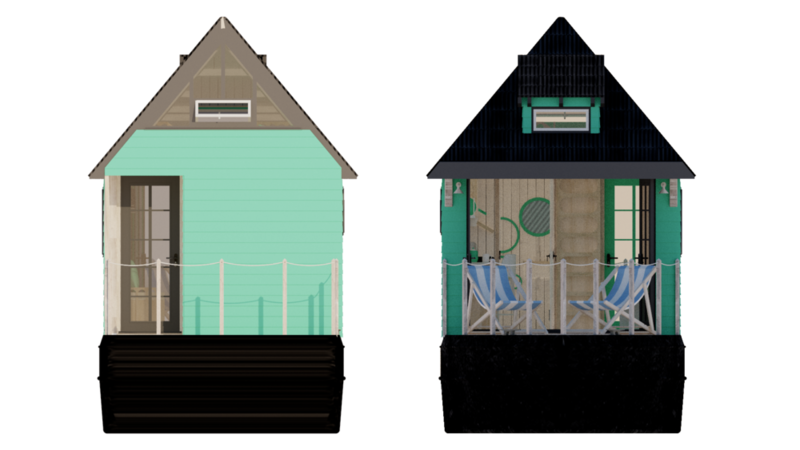 I've designed a classic British deckchair (again made from laminated plywood lengths), and put two of them on the deck to give you a decent idea of how much space you get to play with. I'm sure a small round table would also fit if you wanted to sit outside and eat. Or perhaps you would redesign it entirely and make a built-in lounging area around the perimeter of the deck (forming a sort of U shape), with a table that can be pulled up from the deck itself! The choice is yours! Perhaps what I love most about this space is that, with the bi-fold doors, you can conjoin the inside space and the outside deck. As I mentioned previously, this would make for a great entertaining space. Overall, I think this design has been another pretty successful one, especially with the playful nature of it, and the versatile ground floor space. 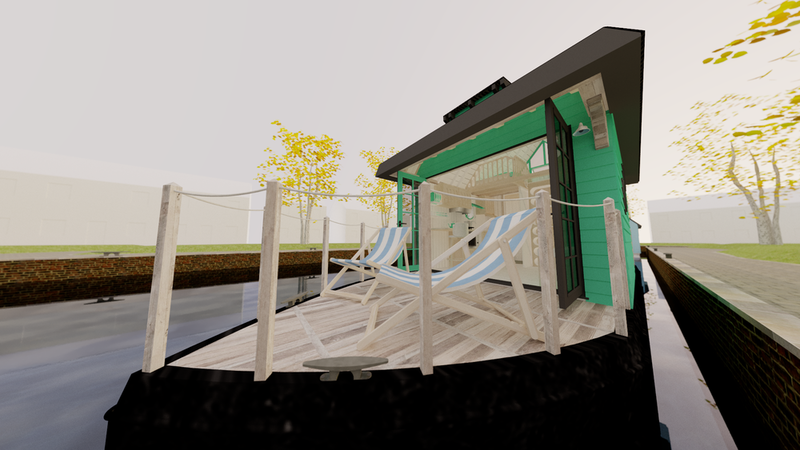 The deck has been a welcome addition to the design (originally I just had the house on floats, but on the last day of this design, I felt a barge hull would be far more stable and suitable. I'm glad I made that change, even if it meant re-rendering everything. As for improvements for future, I've already mentioned the possibility of the deck seating and pull-up table, but I also realised that the hull has the potential for more creative storage solutions. Trapdoors in the main living space, leading down into the hull, would create a convenient and large storage area. Elsewhere, the aforementioned loft ammendments would potentially allow for a queen-sized bed for those seeking a retreat for couples. There's also a lack of appliances (including a TV and other entertainment devices), so plenty of scope for developing this idea further should you wish to. 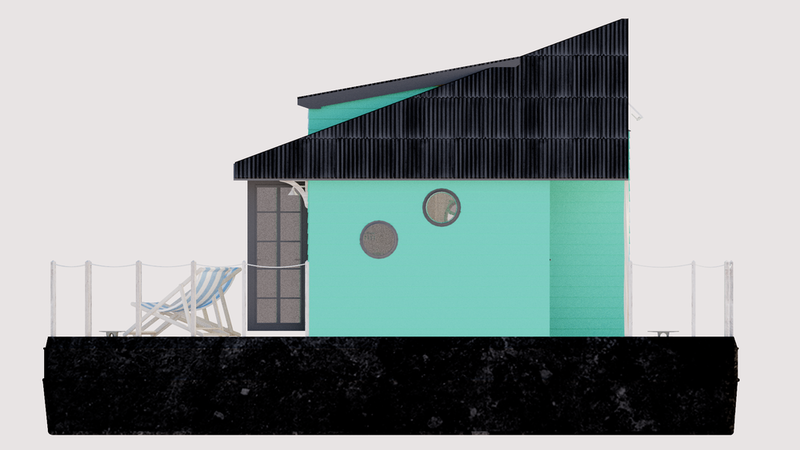 But as it currently stands, it's still a fairly practical design for one person, especially as a holiday home. So, if you enjoyed this design and blog post, or have feedback and suggestions, please post a comment below. As always, I'd love to hear suggestions of fun, quirky and unusual tiny house concepts. I'm also open to requests; be it cabins, garden offices, renovations of old buildings or something entirely different! Thanks for reading - 'till next time! Note the original version of my design on the right - no decks, and it lives precariously on plastic floats! Mooring Cleats - Brandy E.
Composting Toilet - Jack J.